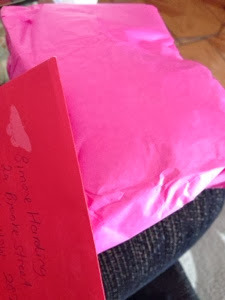 Today my next door neighbour popped over and gave me my parcel saving me a trip to the post office. 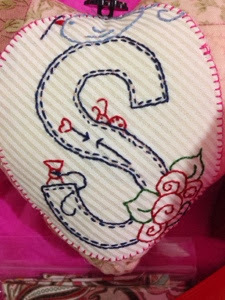 I recognised the name on the back Sue she blogs at http://quiltedhugsandothernonsense.blogspot.com.au. My daughter opened the parcel to make sure what was inside was all wrapped up. Yes it was. 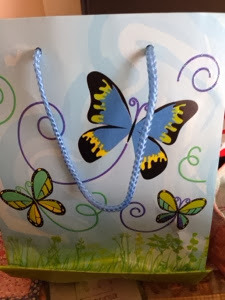 Here is the gift bag. Temptation got the better of me so I first opened the card. What a gorgeous card and beautiful message inside. 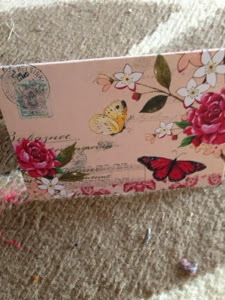 These are the gorgeous gifts I found in the pink paper. Look at the stitchery. I love it. Over the weekend I am going to sit down and have a cuppa and those chocolates. Thank you Cheryll for hosting the swap and to Sue for the amazing gifts. You cheeky girl Simone - and no will power either!!;lol. 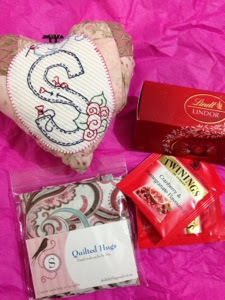 The gifts are lovely and like you I love the embroidery! Sue has made you such a lovely heart Simone. Enjoy those choccies! Oh WOW... love the "S" in your own personal heart!